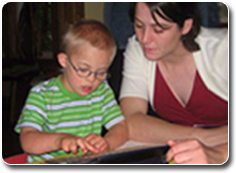 This literacy curriculum was evaluated by Dr. Janice Light and Dr. David McNaughton through a series of research studies funded by the National Institute on Disability and Rehabilitation Research (NIDRR) as part of the Rehabilitation Research Center on Communication Enhancement (The AAC-RERC) (grant # H133E030018). A total of 10 individuals have participated in the research project to date. All of the participants have complex communication needs. was typically scheduled 1-2 times per week for approximately 30-45 minutes per session. This amount of instruction was not ideal. Ideally, participants would have received instruction daily. Results illustrate outcomes in less than ideal circumstances. All of the participants made substantial gains as a result of the literacy instruction. All of the participants learned all of the letter-sound correspondences. All of the participants acquired phonological awareness skills such as sound blending and phoneme segmentation. They learned to apply these skills during decoding and writing activities. All of the participants learned to read simple words. All of the participants learned to apply their decoding/sight word recognition skills during shared reading activities. All of the participants learned to read and understand simple sentences and stories. Click here to see videos of the students’ success stories.